Struggling With Leather & Vinyl? No - You Don't Need A New Sewing Machine. You're planning to tackle velvet and leather. You've had trouble with sewing vinyl / oilcloth / velvet / leather / suede etc. You're fed up with your sewing machine not budging with these materials. Time to get a better machine, perhaps? 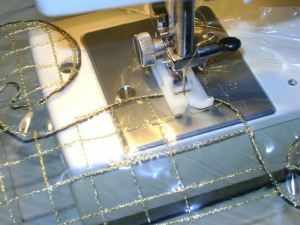 There's NOTHING more frustrating than having trouble sewing heavy seams or expensive fabric - especially on silky velvet or soft leather - where unpicking ISN'T an option...! "Yesterday was not a very productive day. As you can see in the picture, there is not much joy involved in the work [of sewing with velvet]....."
What if sewing "grabby" & "sticky" fabrics perfectly were easier than you think? Imagine being able to finish ALL your velvet/leather / suede/vinyl / oilcloth projects neatly, on your own machine, done easily, quickly, and with Great Results EVERY TIME because you know how! The Secret Weapon that takes the stress out of sewing leather/suede / vinyl is a Non-Stick Teflon Foot. This foot simply snaps on - like all the other feet that came with your machine! This Universal Non-Stick Teflon Foot is the perfect partner for your Domestic Sewing Machine, such as the popular Janome DC2050 and DC2150 (which we also sell. See our other listings). I've personally visited the factory to verify for myself. I was genuinely impressed because of they're a high-quality assurance standard - specified by Janome Japan - the parent company of Janome Australia. A perfect partner for your Sewing Machines, such as a Janome DC2150 or JR1012. Use this non-stick foot to create straight and decorative stitches on leather, vinyl, suede / Ultrasuede, and other demanding fabrics. What makes this foot "ultra-glide"? How does it handle sticky fabrics? Believe it or not, Teflon is not used just for pots and pans in the kitchen! A coating of super smooth Teflon on the sole of this foot makes it glide over your sticky, rubbery fabrics that "grabs" or anything else that gives a metal foot a hard time. This foot - like the roller foot - is designed to prevent fabrics such as leather and vinyl / oil-cloth, plastic, suedes, and Ultrasuede from sticking to the bottom of the foot and to the footplate of the sewing machine. However there is no need for rollers because it is made of or coated with - you guessed it - Teflon, a material well known for its non-stick properties in pots and pans, simple, huh?! Your Non-Stick Teflon foot allows fabrics that are sticky to glide right under the foot.The foot, unlike other feet, has a distinctive look, like that of a white plastic material. 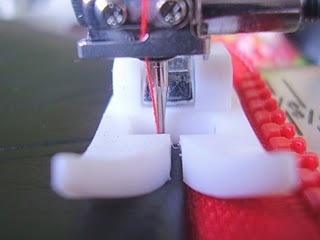 This foot is also good for sewing on zippers on difficult fabric, allowing the foot to glide right over the zipper teeth. Next, grab some leather/suede / vinyl and have a go. It's as simple as that! Try leather or suede applique - a simple zigzag stitch around your design is all you need. The result is impressive! Worst of all: you go to unpick the problem area only to find holes formed in your fabric permanently. So you'd have to start all over again....! 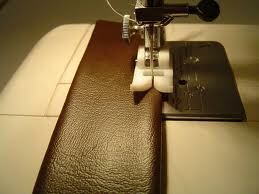 This means you need to cut a brand-new piece out of your expensive leather or fabric.... wasting time AND money. NO! Get a Non-Stick Teflon Foot and Experience the Difference for yourself...! 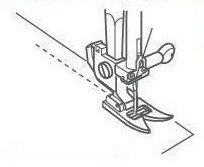 What this foot does is simply gliding over your otherwise-sticky fabrics, eliminating the issue of your pieces getting stuck between the presser foot and feed dog. That means... No More Struggle! Handle tricky materials like leather/suede/ vinyl - Done Quickly & Easily. Save Time so that you can Get your project done - already! or Grab the Second one for a friend? Simply Click Here To Get Yours Now!